Firstly – have you subscribed to the Hungry Healthy Happy blog yet? All my new recipes will be sent straight to your inbox, which means you won’t miss one (as Facebook is hiding most of my posts from you all). Also, there is going to be a special competition just for subscribers soon. Click here to subscribe. Summer might be over, but that doesn’t mean we can’t enjoy some frozen treats. As far as I am aware, ice cream is a year round food, so these frozen banana bites can be too. I am all for giving into the ice cream cravings every now and then, but if I gave into them all the time, I wouldn’t keep all this weight off for long. So, what’s the answer? A healthy alternative of course! 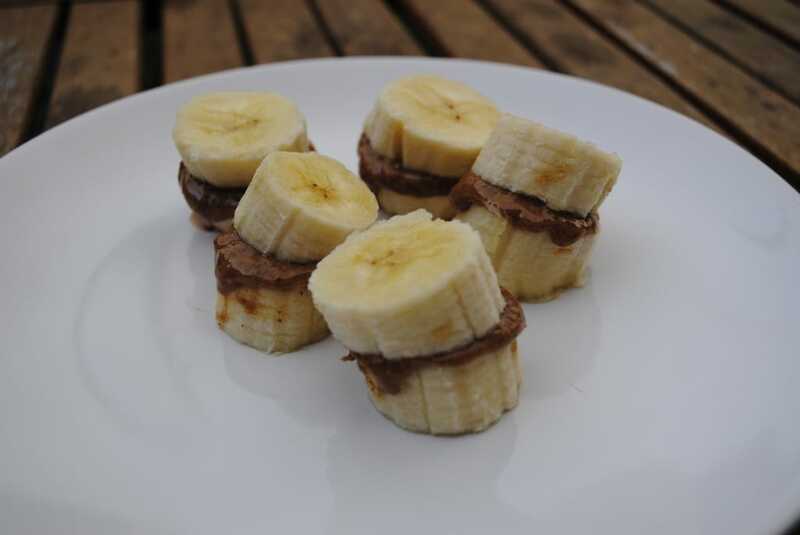 As well as my healthy ice cream recipe, I like to make these little frozen banana bites for dessert. Less talking, more drooling over pictures. If you want a bit more of a treat, dip them in melted dark chocolate too. 1) Slice the bananas into fairly thick slices. 2) Spread almond butter on half of them and then top them with the other banana slices. 3) Freeze for 3 hours. Maybe with some jam in the middle too? Such a simple idea. I love it! Just found these on Pinterest. Loving all your recipes. Dessert for tonight is now in the freezer. Thanks dannii! I eat ice cream all year round too. No shame in it! Bit cold for that today isn’t it? If you have a healthy hot chocolate recipe, that would be better. Dipped in chocolate? Definitely drooling. I am going to make these tonight with cashew butter. Thank you for adding more dessert recipes. That is the area I really struggle with as I have such a sweet tooth.